Hurricanes are no laughing matter, especially for those affected by high winds, evacuation, and flooding. But sometimes their names are pretty funny. And I can’t help it. All day yesterday I saw headlines about Dolly “lashing” Texas — or whatnot — and I kept picturing a giant cloned sheep with a whip in its mouth. 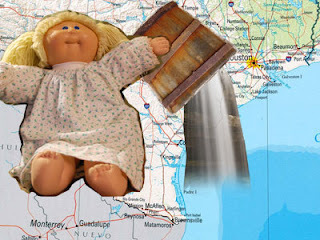 Today, I saw this headline: “Dolly Dumps Heavy Rain on Texas Coast.” And, unbidden, a new and equally horrific image popped into my mind. So I did a quick-and-dirty Photoshop recreation of it. Maybe this should be a series: Crappy Illustrations of Timely Headlines.